1. 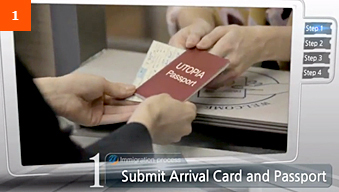 Submit arrival card and passport. 2. 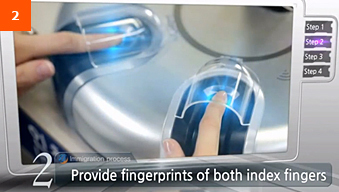 Provide fingerprints of both index fingers. 3. Take a face photo. * The photo should be taken without sunglasses or hats. Talking on the cell phone is not allowed. 4. After final confirmation of the immigration officer, the immigration clearance process is over. 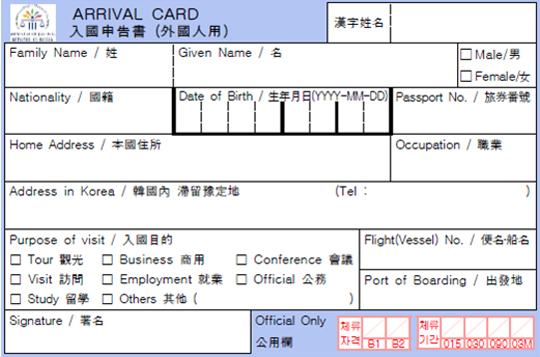 All visitors entering Korea are required to fill out a customs declaration form. While each individual traveler must fill out a form, only one form per family is required when traveling with family members. If you have something to declare, fill out two forms to get one checked and confirmed by the customs officer, and the other to be submitted to the customs clearance officer during the clearance process. This page was last updated on December 28, 2018, and therefore information may differ from what is presented here.